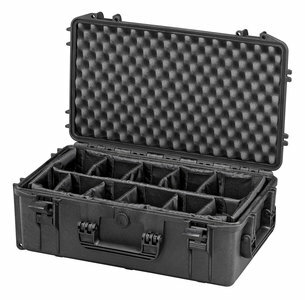 The perfect alternative for a Peli 1510, SKB 3i-2011-7, Storm IM2500, Explorer 5117 or HPRC 2530. The perfect case for your camera with lenses and accessories. The padded dividers have a velcro edge so you can build any config you want. Also perfect and flexible for your go pro or any other action camera. The velcro dividers have a fixed width, so you have to build compartments according to their size.